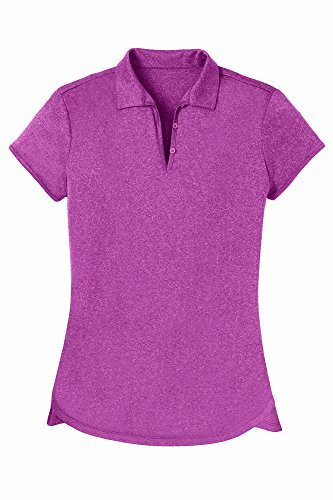 We designed this golf polo to be your feather-light luxuriously soft & extremely comfortable first choice every day. The body is made with a feminine silhouette, yet designed to keep you covered when swinging the clubs, running or most any other active endeavor. This specially designed fit and style is so comfortable it allows you to stay focused on your activity and not worry about the back flipping up, the arms binding or sweat showing. Women love them and continuously come back for more colors. This shirt is soft, soft, soft and is great for exercising, yoga, running, work, every day ware or just lounging around. You'll be reaching for it again and again. CRAFTSMANSHIP: Opna Tech 100% Polyester Fabric has been Designed with "Bright Rich Colors", top-notch performance, comfort, quality and value. This shirt is "Very Comfortable". PERFORMANCE: Moisture Wicking, incredibly fast drying, 4 way stretch, wrinkle resistant. COMFORT: Incredibly Soft & Lightweight, Moisture Wicking, Breathable & a Full Range of Motion. UNIVERSAL: Fashionable and Feminine! Exceptional for Golf, Sports, Exercise, Casual & Office Wear. VALUE: A superior product at a value price: If you like the quality of Nike, Adidas, Lady Hagen, Slazenger or Athleta sport T-Shirts & Tees, but don't like the higher prices, then you'll love our Opna(tm) Athletic Wear. Shop with confidence...100% Satisfaction Guaranteed. If you have any questions about this product by Opna, contact us by completing and submitting the form below. If you are looking for a specif part number, please include it with your message.